The ergonomic design of this Aluminum Mini Laptop Stand with Carrying Bag offers computing comfort with a removable microfiber sleeve that can be used as a mouse pad of wiping cloth. 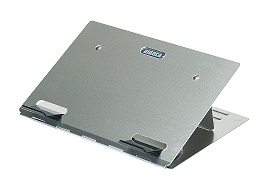 This compact aluminum Netbook stand offers a sturdy and stable platform for your computing needs. For 7" - 12" Netbooks. Compact and extra light, 0.65 lbs. Dimensions 9.75" x 6.75" x 0.5". Holds Netbooks up to 6.6 lbs. Removable microfiber sleeve can be used as a mouse pad or wiping cloth. Angle adjustments 19°, 22°, 25° for increased computer comfort. Sturdy and stable aluminum material with heat dispersing capability. This lightweight and compact Netbook Stand is the ideal accessory to increase your computing comfort.